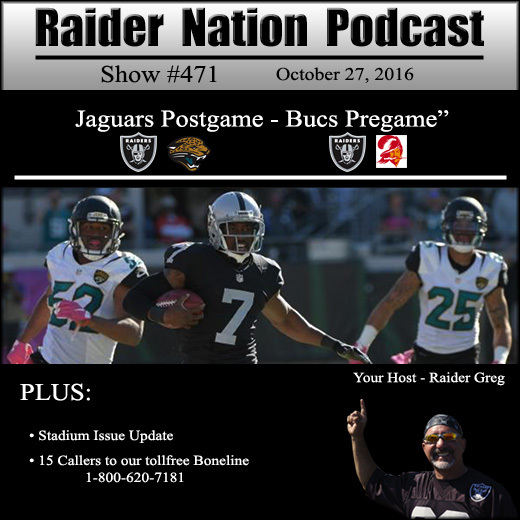 Raider Nation Podcast - Show #471 "Jaguars Postgame/Buccaneers Pregame"
Raider Greg's thoughts on the win over the Jaguars in Jacksonville, plus audio from postgame discussion on the Raiders flagship station 95.7 The Game. Includes thoughts from Greg Papa, Bill Romanowski and more. Raider Greg's pregame breakdown, plus thoughts from JT The Brick via 95.7 The Game. 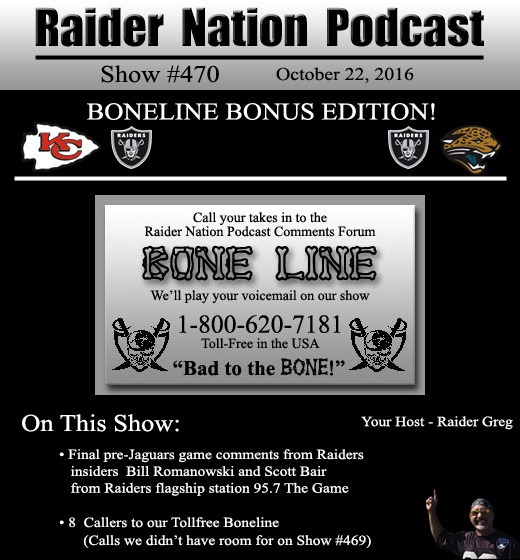 Raider Nation Podcast - Show #470 "Boneline Bonus on eve of Raiders @ Jaguars"
Comments from 4-time Superbowl winning ex-Raider Bill Romanowski, originally aired on the Raiders flagship station 95.7 The Game on Friday October 21st. An interview with Scott Bair on the Damon Bruce Show, originally aired on the Raiders flagship station 95.7 The Game on Friday October 21st. Music credit: Bad to the Bone by George Thorogood. 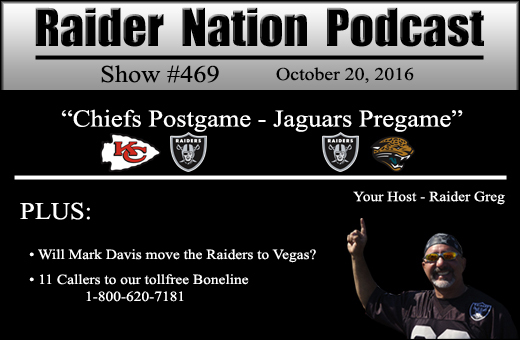 Raider Nation Podcast - Show #469 online "Chiefs Postgame - Jaguars Pregame"
Segment #1: Will Mark Davis move the Raiders to Las Vegas? The Chiefs defeated the Raiders fairly easily on a rainy day in Oakland. Raiders Greg's thoughts on this game and the state of the Raiders. Also excerpts from Raiders talk on their flagship radio station 95.7 The Game by way of Bill Romanowski, Lorenzo Neal, Chris Townsend, and Matt Steinmetz on The Football Hour this Tuesday. The Raiders travel to Jacksonville this Sunday for the first of two games in Florida. Raider Greg previews, plus thoughts from JT The Brick via his show on 95.7 The Game, previously aired on Wednesday Oct. 19th. 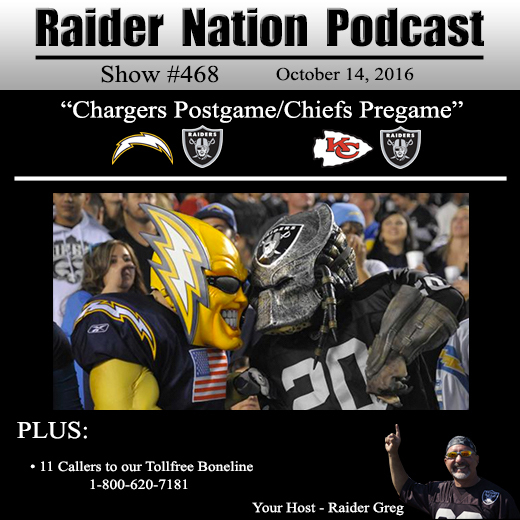 Raider Nation Podcast - Show #468 "Chargers Postgame/Chiefs Pregame"
The Las Vegas stadium project received approval from the Nevada Senate and Assembly, and Eddie DeBartolo group jumps into the Oakland stadium scene along with Ronnie Lott. The Kansas City Chiefs come into Oakland off of their bye week. Raider Greg previews. 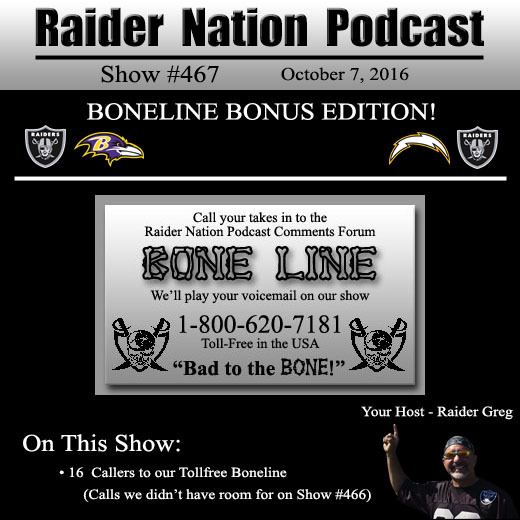 Raider Nation Podcast - Show #467 "Boneline BONUS EDITION"
We had so many calls to our toll-free "Boneline" this week, it was hard to decide which ones to use on show #466. Way too many calls to use all of them, so this will be a bonus podcast with just the extra calls. Greg is on vacation for ten days in Hawaii, and will try to do a show after the Chargers game from his hotel. Taken from Greg Papa's AFTERNOON DELIGHT radio show on the Raiders flagship station 95.7 The Game, originally aired on Wednesday. Greg Papa makes some great comments about our current Raiders team, and he issues them a challenge that we wanted to close with. Music credit: The Raiders by Sam Spence; Bad to the Bone by George Thorogood; Raider Nation by Ice Cube. 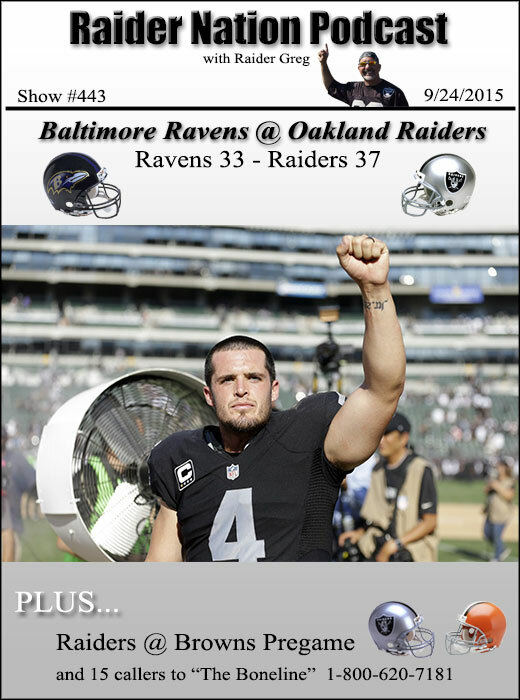 Raider Nation Podcast - Show #466 "Ravens Postgame/Chargers Pregame"
Derek Carr, Michael Crabtree, and the rest of the Raiders offense had to come from behind and score a touchdown, then our defense was tested again at the end of this game, and came through with a big stop. Raider Greg recaps the game. We also hear from JT The Brick, Derek Carr, Seth Roberts, and more audio originally broadcast on the Raiders flagship station 95.7 The Game. The Chargers may be 1-3, but they could easily be 4-0 with a few points going their way. The Raiders will be tested once more, and need a win at home this weekend. Music credit: The Raiders by Sam Spence; Back in Black by AC-DC; Just Hit by 4DUB, Bad to the Bone by George Thorogood. 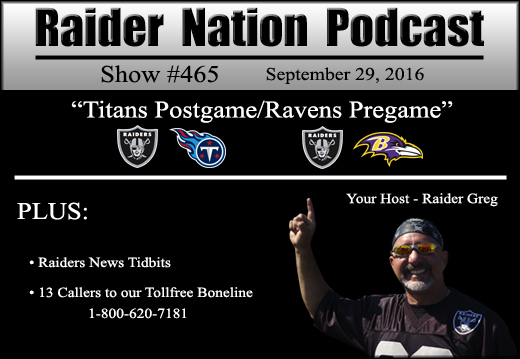 Raider Nation Podcast - Show #465 "Titans Postgame/Ravens Pregame"
Comments on Marcel Reece being cut from the roster. Thank you Marcel for all you've done for the Raiders over the years. We will miss you. Also, another update on the Las Vegas stadium proposal. Plus a recent signing on our defensive line. The Raiders defense stepped up in this game and forced three turnovers, which made the difference. We recap the game and hear comments from the voice of the Raiders Greg Papa, Bill Romanowski, Lorenzo Neal and Chris Townsend, along with Jack Del Rio and Damon Bruce, from sports talk aired this week on the Raiders flagship station 95.7 The Game. Raider Greg starts this segment previewing the Raiders fourth game of the season in Baltimore, then we hear some thoughts on this upcoming game from Greg Papa, previously aired Wednesday on 95.7 The Game during hour two of his Afternoon Delight Show. 04. Raider Chuko from East L.A.
Music credit: The Raiders by Sam Spence; Back in Black by AC-DC; Defense by 4DUB, Bad to the Bone by George Thorogood. 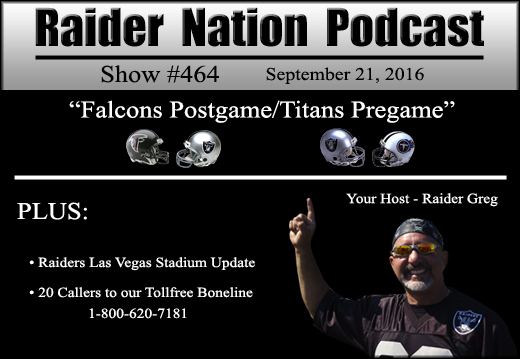 Raider Nation Podcast - Show #464 "Falcons Postgame/Titans Pregame"
Raiders Las Vegas stadium proposal update. Raider Greg reviews latest happenings in Las Vegas on this issue. Breaking news since this segment, the financial group connected with Ronnie Lott has made an offer to buy the land that the Oakland Coliseum sits on. The Raiders defense gave up a lot of yards, and a lot of points, and the Raiders offense couldn't pull out a victory. We recap the game and hear comments from the voice of the Raiders Greg Papa, along with Latavius Murray, Derek Carr, Jack Del Rio, Damon Bruce, from sports talk aired this week on the Raiders flagship station 95.7 The Game. Raider Greg starts this segment previewing the Raiders third game of the season in Nashville, then we hear from Greg Papa, Bill Romanowski, Lorenzo Neal, and Chris Townsend from "The Football Hour" on 95.7 The Game. Music credit: The Raiders by Sam Spence; Back in Black by AC-DC; Dazed and Confused by Led Zeppelin, Bad to the Bone by George Thorogood. Raider Nation Podcast - Show #463 "Saints Postgame/Falcons Pregame"
The Raiders, Chiefs, and Broncos win, and the Chargers lose. The Raiders win a thriller in New Orleans to start their 2016 season. Raiders score on a 2 point conversion with under a minute on the clock to take a one point lead, then our defense forced a 61 yard field goal attempt by the Saints that barely missed wide left. Raider Greg reviews the game, and we hear highlights from Greg Papa, comments from Coach Del Rio, Raiders LB Bruce Irvin, former Atlanta Falcon Jamie Dukes, and Raiders insider Scott Bair - all originally aired on the Raiders flagship station 95.7 The Game. 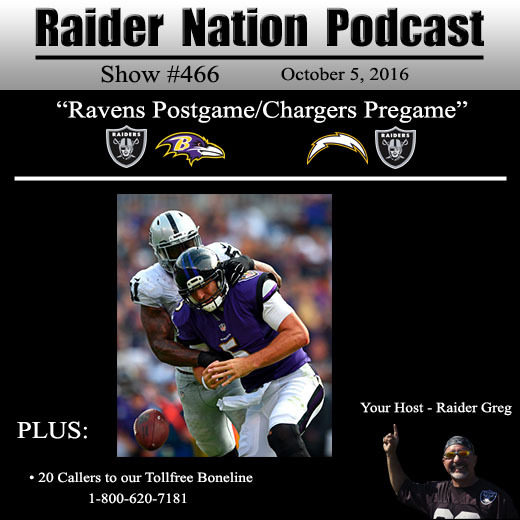 Raider Greg will be at the home opener, along with many of our podcast listeners, and we preview the game. Music credit: The Raiders by Sam Spence; Back in Black by AC-DC; Defense by 4DUB; Bad to the Bone by George Thorogood. 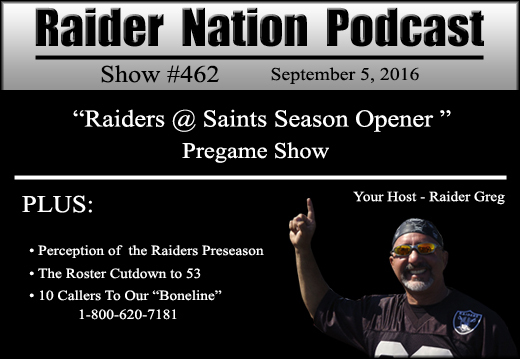 Raider Nation Podcast - Show #462 "Raiders @ Saints Season Opener Pregame Show"
Raider Greg reviews the preseason, and gives his perception of where the Raiders sit going into the first quarter of our season. Who got cut and who didn't. Did we lose anyone we wish we hadn't? This game opened as "pick-em" in the sports books. The Saints are favored by about one point in most books as the game approaches. Raider Greg thinks the Raiders will win. Music credit: The Raiders by Sam Spence; Back in Black by AC-DC; Going Down For Real by Flo Rida; Bad to the Bone by George Thorogood. 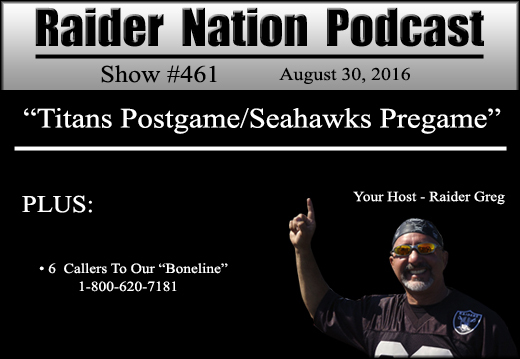 Raider Nation Podcast - Show #461 "Titans Postgame/Seahawks Pregame"
Raider Greg comments on the Colin Kaepernick not standing for the National Anthem issue. The third game of the preseason was a loss for the Raiders. Raider Greg comments, and we hear from Greg Papa and Lincoln Kennedy from 95.7 The Game's Afternoon Delight Show. Last game of the preseason coming up Thursday. Raider Greg shares his thoughts. Music credit: The Raiders by Sam Spence; Back in Black by AC-DC; Roll Out by Ludacris; Bad to the Bone by George Thorogood. 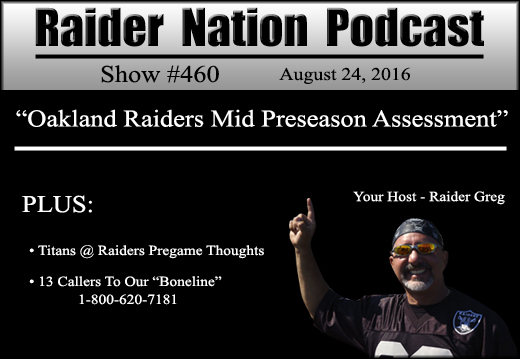 Raider Nation Podcast - Show #460 "Oakland Raiders Mid-Preseason Assessment"
We didn't do a postgame podcast after the Raiders first preseason game with the Arizona Cardinals, so in this show we'll recap that game as well as the second preseason game vs the Green Bay Packers. It's only preseason, but Raider Greg has some concerns, and so does the voice of the Raiders Greg Papa, and we'll hear some comments he made in that regard from his Afternoon Delight radio show on 95.7 The Game. The third game of the preseason is supposed to be the preseason game most like a regular season game, complete with game planning. But the Raiders will be playing the Titans, who they play in game three of the regular season. Regardless, Raider Greg wants to see what the Raiders can do, even if it gives something away to the Titans. Music credit: The Raiders by Sam Spence; Back in Black by AC-DC; Going Down For Real by Flo Rida; Big Time by Peter Gabriel; The Autumn Wind by NFL Films; Bad to the Bone by George Thorogood. 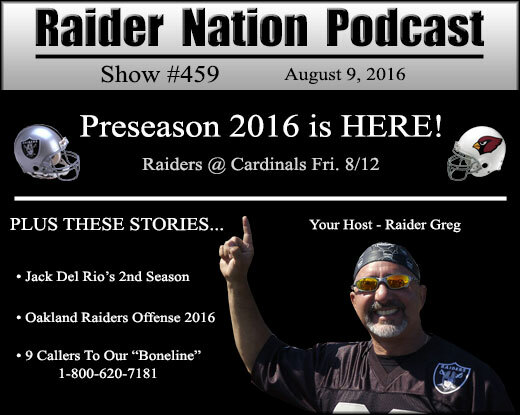 Raider Nation Podcast - Show #459 online "Oakland Raiders Preseason Is Here!" We expect Jack Del Rio to have greater success in his second year as head coach. Most of the team will be in their second year under his system. Raider Greg reviews the coaching staff and gives his thoughts. We hear portions of coaches press conferences from Raiders.com, as well as a portion of the Raiders Roundtable held at Raiders training camp by radio 95.7 The Game. Big things are expected from the Raiders' offensive line this year. They are already rated as one of the best offensive lines in the NFL. We review the players and how they are doing as we approach our first preseason game vs the Arizona Cardinals. Raider Greg talks some on the rest of the offense as well. We also hear more from one of coach Del Rio's media sessions at training camp. Ken Stabler was inducted into the Hall of Fame last weekend, and we review his career. Greg Papa spoke with Cliff Branch on 95.7 The Game, and we hear some of the interview. 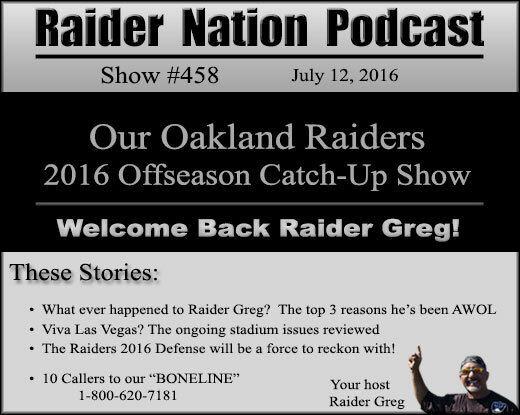 Raider Nation Podcast - Show #458 Online "Raiders 2016 Offseason Catch-up Show"
Raider Greg apologizes for his leave of absence from Raider Nation Podcast for the last four months, and explains his hiatus. Welcome back Greg! Let's get this 2016 season rolling! - Happy belated birthday Al Davis! We miss you Al. Thanks for everything. - DeAngelo Hall sends his advice via Twitter to Kevin Durant after his signing with the Golden State Warriors, "Just don't become a Raiders fan". Thanks DeAngelo, but we and Kevin can do without your advice. Las Vegas is still working on getting a new stadium proposal. This week the Nevada Tourism panel discussed nine potential sites for a Raiders stadium, up from four sites discussed previously. The estimated price tag has also gone up, to between $1.4 to $2.1 Billion. Raider Greg gives his thoughts. We go over the offseason upgrades the Raiders have made to their defense. Next show we will go over the upgrades to the offensive line. Music credit: The Raiders by Sam Spence; Back in Black by AC-DC; Sail by Awolnation; Bad to the Bone by George Thorogood. 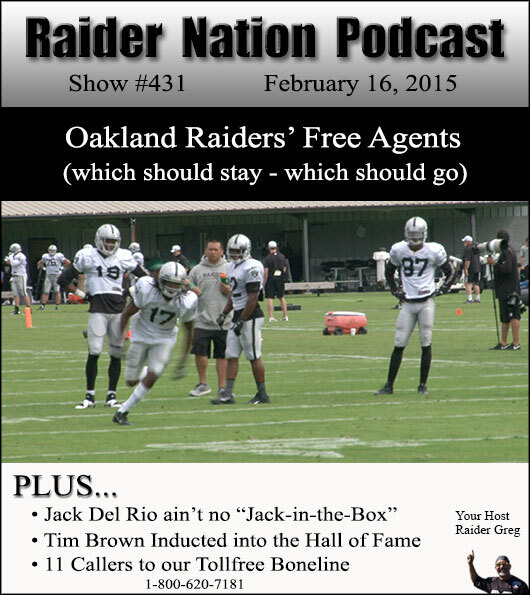 Raider Nation Podcast - Show #457 online - "Raiders make splash in Free Agency"
Segment #1: Power Shift in AFC West? The Broncos lost Peyton Manning to retirement and Brock Osweiler to free agency. The Chiefs lose CB Sean Smith to the Raiders. The Raiders have played the Chargers well recently and Rivers is a year older. The Raiders are young and fortified with great new talent, and the 2016 draft is yet to come, the Raiders having 8 picks this year. Things are looking up for the Raiders in the AFC West. The Raiders added OL Kelechi Osemele from the Ravens, LB Bruce Irvin from the Seahawks, CB Sean Smith from the Chiefs, LB Daren Bates from the Rams, S Brynden Trawick from the Ravens, and resigned LT Donald Penn, K Marquette King, WR Andre Holmes, and WR Seth Roberts. NFL analysts are ranking the Raiders offensive line #1 in the NFL, and many are picking the Raiders to make the playoffs with up to 11 wins. The 2016 season is shaping up to be very exciting for the Oakland Raiders. You can call in to the Boneline and get on the podcast yourself. Toll-Free 1-800-620-7181. Try to keep your call around 2-3 minutes long. If we get a lot of calls we may not be able to air all of them, so make them good. Preference may be given to first time callers. Sorry if your call is not aired. Please call back to get on another show. 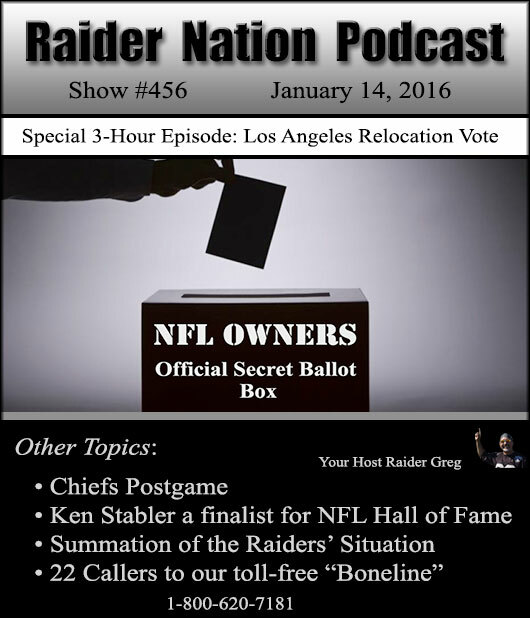 Raider Nation Podcast - Show #456: "Special 3 Hour L.A. Relocation Vote Episode"
Brief thoughts on the Raiders season finale at Kansas City. Ken Stabler is one of two senior committee finalists for the NFL Pro Football Hall of Fame Class of 2016. Raider Greg gives his thoughts on his nomination and selection as a finalist. NFL owners met in Houston this week to discuss and vote on which team or teams will be allowed to relocate to Los Angeles. Raider Greg gives his thoughts, plus we hear from several others on the topic via the Raiders flagship station 95.7 "The Game". ESPN NFL reporter Jim Trotter gives his opinions and explains the G4 stadium loan situation, the $100 Million offered the Raiders and Chargers if they build new stadiums in their existing markets, and more. Greg Papa and John Lund discuss the outcome of the vote and it's implications for the Raiders and Raider Nation. Oakland Mayor Libby Schaaf joins Chad, Joe, and Lo on 95.7 to discuss her feelings and what the City of Oakland is hoping to do to help the Raiders build a new stadium in Oakland. Raiders season wrap-up thoughts and a look forward to the 2016 season, the Raiders opponents both home and away, and Raider Greg's feelings on the outlook for the Raiders in 2016. We also hear from JT The Brick via the Damon Bruce Show on 95.7 The Game. 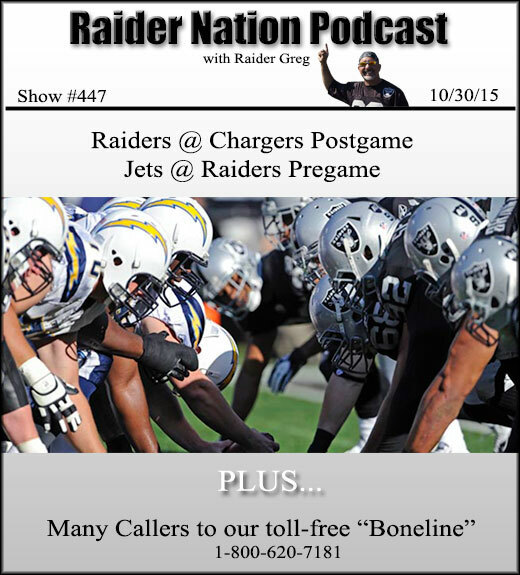 Raider Nation Podcast - Show #455: "Chargers Postgame - Last game in Oakland?" 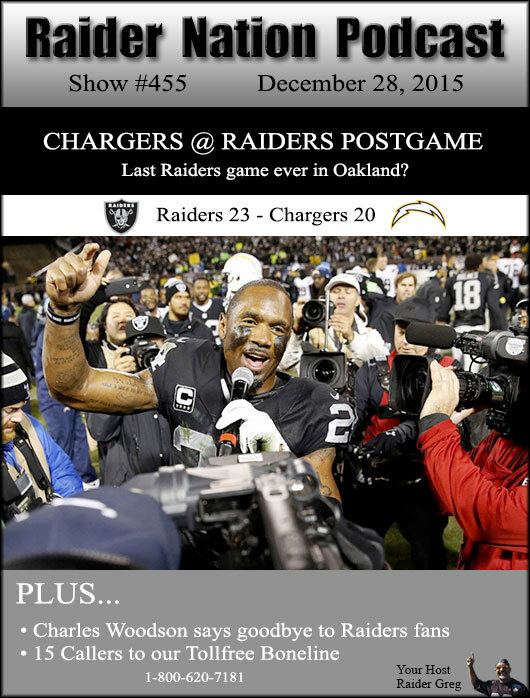 Segment #1: Chargers at Raiders Postgame - Was that the last ever Raiders game in Oakland? The Raiders beat the Chargers in a close hard fought game that went right down to the wire. It was the last home game for Charles Woodson, with one more game in Kansas City before he retires. Anyone who was at this game couldn't help but wonder if we were watching the last ever Raiders game in Oakland. The tailgate party was emotional, and Raider Greg gives you his thoughts. We also hear Charles Woodson's speech on the field to the fans at the end of the game, as well as his locker room speech. 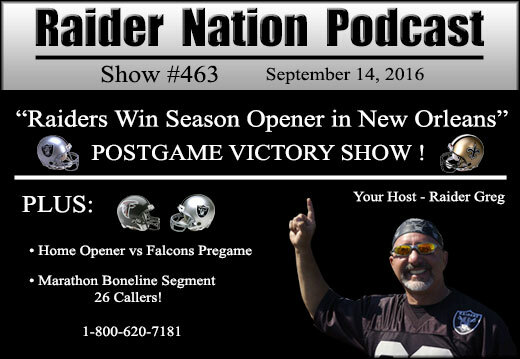 Raider Nation Podcast - Show #454 - "Broncos Postgame - Packers Pregame"
The Raiders beat the Broncos in their own house! The first half was ugly, the second half was a nail biter, and the result was beautiful! Khalil Mack was unstoppable with five sacks. Raider Greg gives you his view of the game and we hear bits of postgame discussion from the Raiders flagship station 95.7 The Game. Included in the segments from 95.7 is the Monday morning Chad, Joe, and Lo show; Trent Dilfer on the Papa and Lund Show Monday; an interview with Coach Del Rio on the Damon Bruce Show Monday afternoon, and The Football Hour on Tuesday with Greg Papa, John Lund, Lorenzo Neal, and Bill Romanowski. The Green Bay Packers will be in Oakland this Sunday. Raider Greg gives his pregame thoughts and we hear from other heard on 95.7 The Game. Included are The Football Hour panel plus thoughts from Jack Del Rio during his weekly segment on the Damon Bruce Show. 09. Captain Raider in D.C. 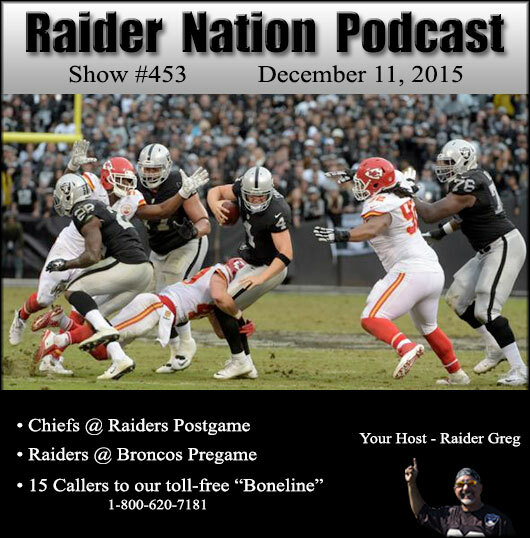 Raider Nation Podcast - Show #453 - "Chiefs Postgame - Broncos Pregame"
A recap of last Sunday's game vs the Chiefs in Oakland. Raider Greg shares his game day experience, starting with the great tailgate party and ending with a disapointing loss in which the Raiders led late in the game, only to lose after three late Derek Carr interceptions. We hear comments from the "Voice of the Raiders" Greg Papa via an interview on 95.7 The Game Monday morning. 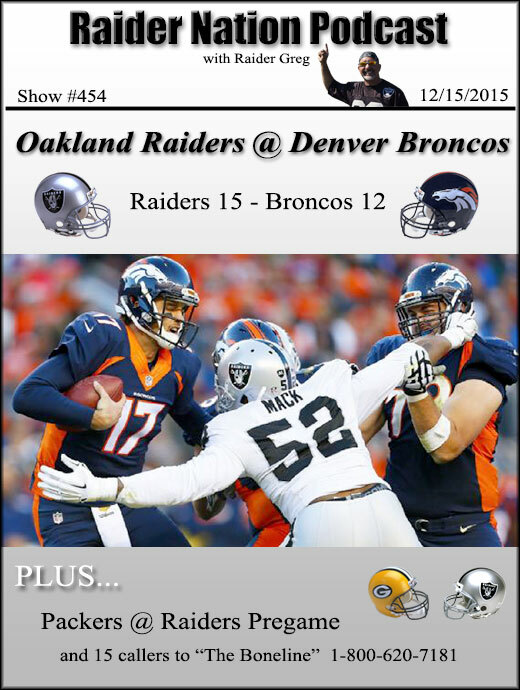 The Raiders travel to Denver to play the Broncos this Sunday. Raider Greg gives his thoughts, and we hear from former Raiders great Lincoln Kennedy via 95.7 The Game. 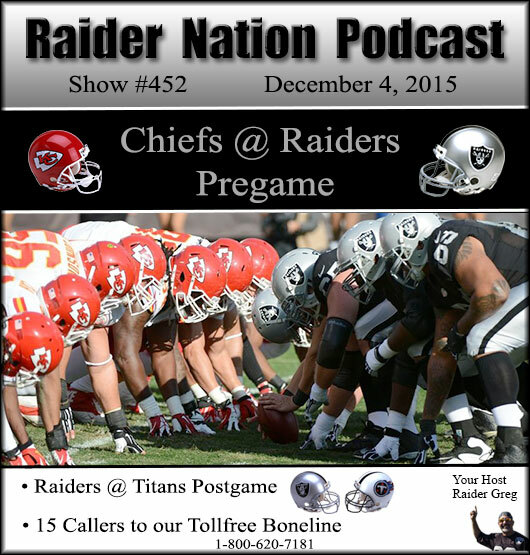 Raider Nation Podcast - Show #452 - "Chiefs Pregame - Titans Postgame"
A recap of last Sunday's game vs the Titans. We hear breakdown from Greg Papa, John Lund, Bill Romanowski and Lorenzo Neal during their weekly "Football Hour" segment on the Raiders flagship station 95.7 The Game. We also hear part of a radio interview with Trent Dilfer, where he gives his opinion on the progress of Derek Carr compared with that of Marcus Mariota. Plus two radio interviews with Raiders wide receiver Seth Roberts, who caught the game winning touchdown pass. At the end of this segment we hear from Michael Wagaman, Senior writer with Silver and Black Illustrated and Associated Press. He gives his opinion on how Amari Cooper, Michael Crabtree, and Seth Roberts stack up as a receiving tandem vs Raiders teams of the past. A preview of this Sundays upcoming game in Oakland. Michael Wagaman gives his opinion on what the Raiders need to do to make the playoffs this year, via his interview this week on 95.7 The Game on the Chris Townsend Show. Music credit: The Raiders by Sam Spence; Back in Black by AC-DC; Super Freak by Rick James; Bad to the Bone by George Thorogood. 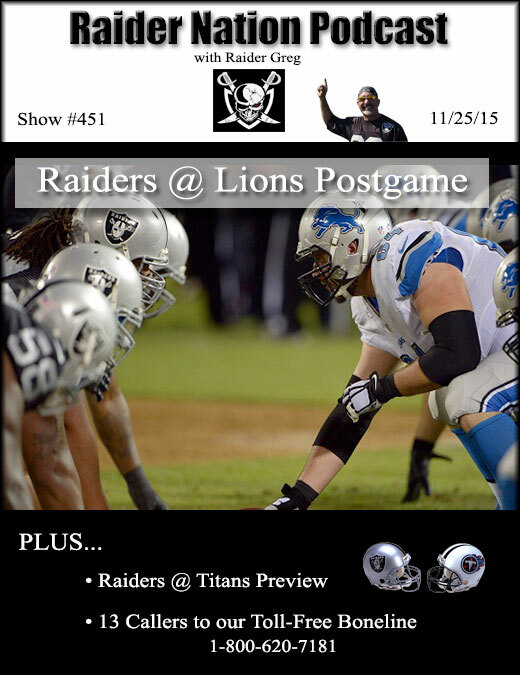 Raider Nation Podcast - Show #451 - "Lions Postgame - Titans Pregame"
A recap of last Sunday's game vs the Lions. We hear breakdown from Greg Papa, Chris Townsend, Bill Romanowski and Lorenzo Neal (from the Raiders flagship station 95.7 The Game). We also hear a portion of Coach Jack Del Rio's weekly segment with Damon Bruce on 95.7 The Game, recorded the day after the Lions game. A preview of this Sundays upcoming game in Nashville. We also hear from Coach Jack Del Rio and the Raiders insiders at 95.7 The Game. 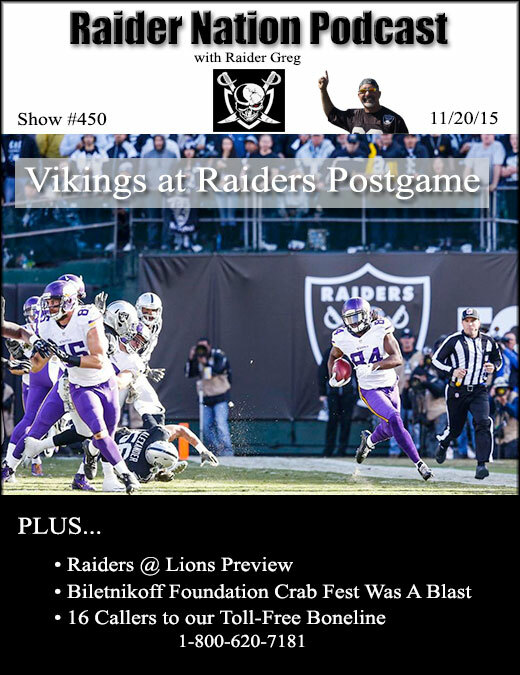 Raider Nation Podcast - Show #450 - "Vikings Postgame - Lions Pregame"
The Biletnikoff Foundation Crab Fest set an attendance record in San Ramon the Friday before the Vikings game. We were there along with Keith Smith The Crusader Raider from London England, along with many Raiders fans from the east coast, Australia, and more. Raider Greg recaps the event and its purpose. A recap of last Sunday's game vs the Vikings. We also hear breakdown from Greg Papa, John Lund, and Lorenzo Neal (from the Raiders flagship station 95.7 The Game). A preview of this Sundays upcoming game in Detroit. We also hear from Coach Jack Del Rio, Ken Norton Jr., and the insiders at 95.7 The Game. 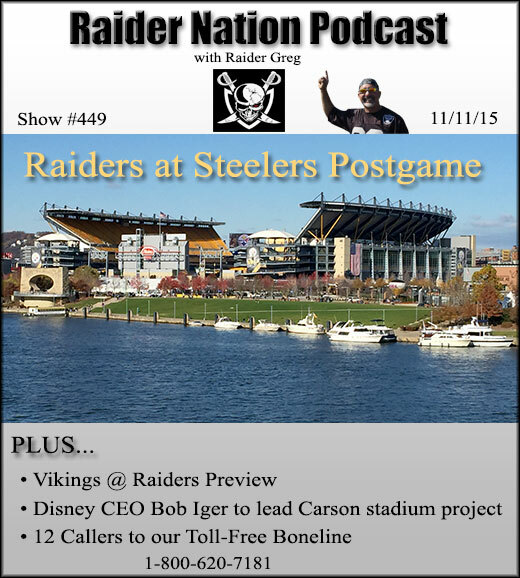 Raider Nation Podcast - Show #449 - "Steelers Postgame - Vikings Pregame"
The Raiders lost a back and forth close battle in Pittsburgh by a score of 37-35. The Raiders trailed late in the 4th quarter, but came back to tie the game 35-35, then lost on a last minute field goal. Raider Greg breaks down the game. We also hear from Raiders insiders via the Raiders flagship station 95.7 The Game. Commentary by Greg Papa, John Lund, Lorenzo Neal, Chris Townsend, James Arcellana, Damon Bruce, and Raiders head coach Jack Del Rio. We look forward to this Sunday's game in Oakland. We also hear breakdown from Greg Papa, John Lund, and Lorenzo Neal. Late breaking news on the Carson project. It was announced today that Disney CEO Bob Iger will be involved in the project. According to Jason La Canfora of CBS Sports, "Disney CEO agrees to lead LA stadium project for Raiders and Chargers. The San Diego Chargers and Oakland Raiders have reached an agreement for Bob Iger, the highly-regarded Disney chairman and CEO, to become chairman of their bid to build a stadium in Carson, Calif. according to sources with knowledge of the situation. It's a potentially game-changing move that could propel those teams to the Los Angeles market by next season. The teams are expected to announce the move shortly, with those clubs assembled in New York for a significant meeting with NFL officials later Wednesday. Iger, who will remain as Disney's chairman and CEO, will become the non-executive chairman of Carson Holdings, LLC and oversee all major initiatives with the venture, including stadium design, naming rights and fan experience, and will be responsible for guiding construction and operation of the facility. The deal is contingent on the NFL owners approving the Carson stadium plan for construction." We have audio originally broadcast on the Raiders flagship station 95.7 The Game coving the topic. Music credit: The Raiders by Sam Spence; Back in Black by AC-DC; Raider Nation by Ice Cube; Bad to the Bone by George Thorogood. 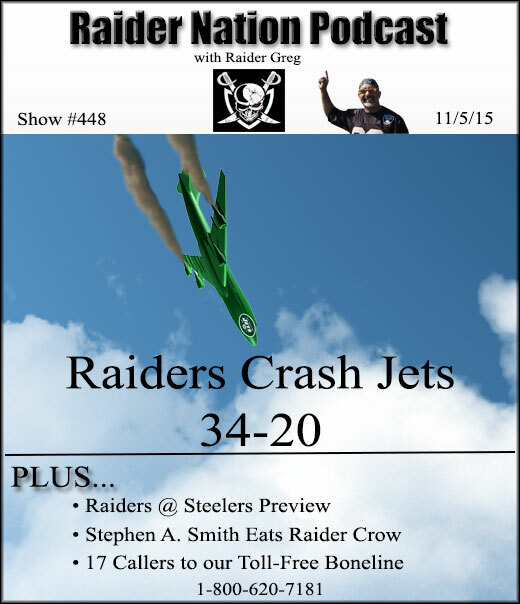 Raider Nation Podcast - Show #448 - "Jets Postgame - Steelers Pregame"
Another very impressive win for the Raiders. Out to a quick lead again, and this time they held a two touchdown lead at the end. Raider Greg describes the mood at the tailgate party and the game. The crew from the Raiders flagship station 95.7 The Game were even at our Bad Boyz of BBQ tailgate party! Raider Greg breaks down the win, plus we hear from the archives of 95.7 The Game, including postgame breakdowns by Greg Papa, John Lund, Bill Romanowski, Lorenzo Neal during The Football Hour. We also hear from the morning show crew Chad, Joe, and Lo. We also hear an interview with Joe Namath. Raider Greg previews this weeks matchup vs the Steelers in Pittsburgh. More insights from insiders at 95.7 The Game, including pregame thoughts from Chad, Joe, and Lo plus Greg Papa, Bill Romanowski, and John Lund from the Football Hour. We also hear Greg Papa interview CBS broadcaster Ian Eagle (who will be broadcasting the Raiders/Steelers game) plus Dan Fouts, who will be Ian's partner on the broadcast. Stephen A. Smith, notorious "hater" of the Raiders, previously calling them "A Football Atrocity", and saying at the beginning of this season that there was "no way" the Raiders would go to the playoffs this year is now saying that the Raiders have a better chance of going to the playoffs than the NY Jets. This week the Raiders hit #9 in the NFL Power Rankings, and Stephen A. says he has to "give it up" for them. 12. The Surface Raider from the U.K.
16. Nicole "The Portuguese Bomber"
Raider Nation Podcast - Show #447 - "Chargers Postgame - Jets Pregame"
The Raiders had a solid victory in San Diego. We recap the win with the addition of audio clips from the Raiders flagship station 95.7 The Game. Music credit: The Raiders by Sam Spence; Back in Black by AC-DC; Bad to the Bone by George Thorogood; South Oakland by Raiderhed. Raider Nation Podcast - Show #446 - "Broncos Postgame plus State of Raiders '15"
We recap this close loss to the Denver Broncos, and share some recollections of the tailgate party with the Bad Boyz of BBQ. We also hear from some Raiders insiders via the Raiders flagship station 95.7 The Game. We hear an excerpt from The Football Hour with Greg Papa, John Lund, Bill Romanowski, and Lorenzo Neal. We also hear an interview with former NFL wide receiver Drew Bennett from The Afternoon Delight Show with Greg Papa and John Lund. Drew explains how wide receivers are supposed to handle "hot reads" when the opposing defense runs a blitz. He also gives some thoughts on Amari Cooper, and what he could do to improve his game. We also hear part of an interview with former Raiders running back Charlie Garner from an appearance on the 95.7's morning show with Chad, Joe, and Lo. The Raiders are a little past the 1/4 point of the season, and Raider Greg does a progress report on the team. 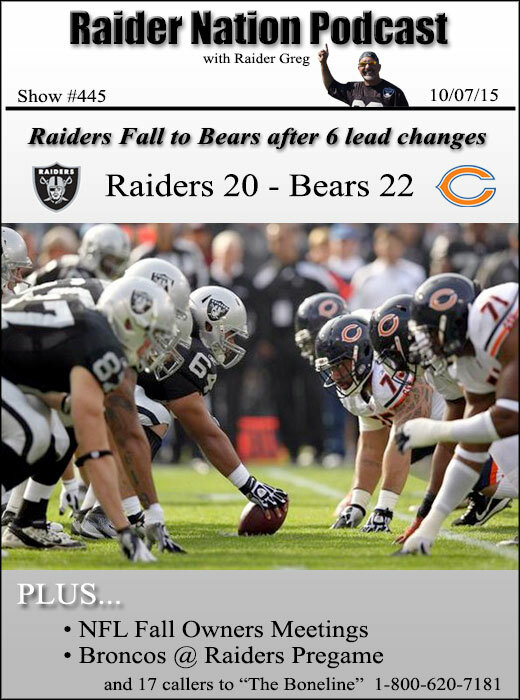 Raider Nation Podcast - Show #445 - "Bears Postgame/Broncos Pregame"
Raider Greg recaps the last second loss to the Bears in Chicago. We also hear from Raiders WR Seth Roberts and Coach Del Rio via the Raiders flagship station 95.7 The Game. We also hear from ESPN's Bill Williamson who follows the Raiders, and also an interview with Raiders QB legend Daryle Lamonica "The Mad Bomber", as he gives his thoughts on Derek Carr and the QB position. The team owners will be discussing the NFL returning to Los Angeles, and other issues. Raider Greg gives his thoughts on what they should discuss. NFL analyst Peter King gives his thoughts on the LA stadium situation. We preview this week's matchup in Oakland vs the Broncos. We also hear from Coach Del Rio, Raiders beat writer Vic Tafur, as well as the member of the "Football Hour" on 95.7 The Game, (Bill Romanowski, Lorenzo Neal, Greg Papa, and John Lund). 16. 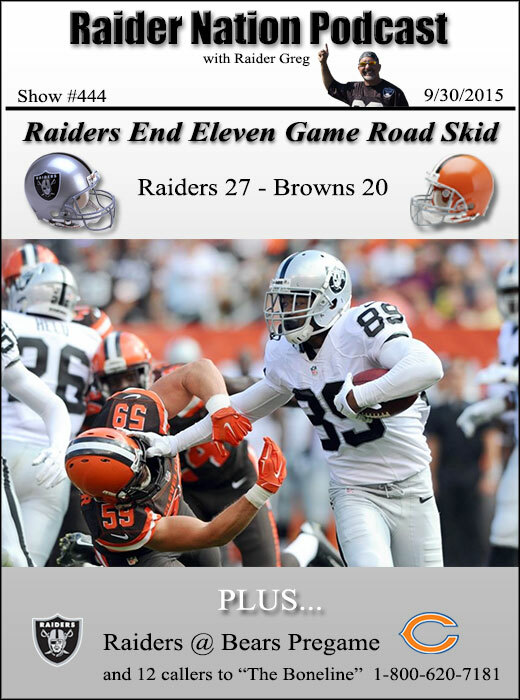 Raider Nicole "The Portuguese Bomber"
Raider Nation Podcast - Show #444 online "Browns Postgame/Bears Pregame"
A Raider Greg opinion piece on the increasing number of penalties and resulting game stoppages in the NFL. The Raiders beat the Browns in Cleveland for their first back to back wins in 44 games, the last time being in the first half of the 2012 season. They broke their 16 game east coast curse, their 11 game road skid, and have a 2-1 start for the first time since 2011. Raider Greg shares his feelings about the game, and we hear from Raiders insiders via the Raiders flagship station 95.7 The Game. First we hear some thoughts on the game from Greg Papa and John Lund from their radio show the day after the game. The a roundtable discussion from Tuesday's Football Hour with Greg Papa, John Lund, Lorenzo Neal and Bill Romanowski. Also comments from Charles Woodson following the game in Cleveland on his game sealing interception. Finally, we hear from Coach Del Rio at his Monday press conference. The Raiders head to Chicago this weekend to try to extend this win streak to three games. The Bears are one of four still winless teams, and are considered the weakest team of the four. The Raiders can't take this game lightly though, as we all know how hard it is to win any game in the NFL, let alone one in enemy territory. We'll hear comments from Raider Greg as well as Coach Del Rio. Music credit: The Raiders by Sam Spence; Back in Black by AC-DC; Blow the Whistle by Too Short; Bad to the Bone by George Thorogood. The Raiders offense came through with an 80 yard touchdown drive to send the Ravens to their first 0-2 start in over ten years. We recap the game and hear from Coach Del Rio's postgame press conference, plus his appearance on the Rich Eisen Show. We hear from Derek Carr in the locker room after the game, plus as a guest on the Haberman and Middlekauff show on 95.7 The Game. We also hear from Raiders insider Scott Bair on the Damon Bruce show. Also we listen in on some of "The Football Hour" on 95.7 with Greg Papa, John Lund, Lorenzo Neal, and Bill Romanowski. Some pregame thoughts as the Raiders prepare to travel to Cleveland for their first away game of 2015. 10. Raider D from the I.E. 15. Raider Nicole "The Portuguese Bomber"
Raider Nation Podcast - Show #442 "Bengals Postgame - Ravens Pregame"
Raider Greg was at the game, and he shares thoughts on the game, the tailgate parties, the hopes of the fans, and the outcome. We also hear from Coach Del Rio as he does a phone interview with Damon Bruce on the Raiders' flagship station 95.7 "The Game". We also hear part of Coach Del Rio's postgame press conference. Pregame thoughts on this week's matchup with the Baltimore Ravens. Coach Del Rio talks with Damon Bruce about how the Raiders will prepare for this Ravens game. 01. Johnny D "The Bluegrass Raider"
14. 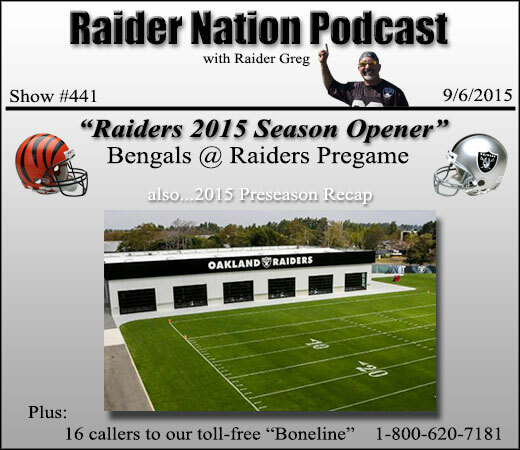 Raider Nicole, "The Portuguese Bomber"
Raider Nation Podcast - Show #441 "Raiders Preseason Recap and Bengals Pregame"
Raider Greg gives his overall summary of the Raiders preseason and how he feels going into the regular season. We also hear a clip from the Raiders flagship station 95.7 The Game, an interview with former Raiders player Andre Carter. Andre gives his observations of Khalil Mack, his pass rushing skills, and tells us what kind of player he thinks Mack is and will be as he develops. 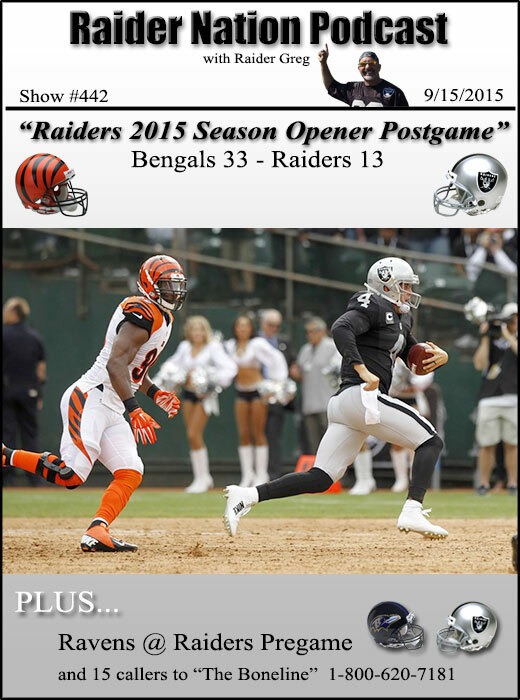 Pregame breakdown and prediction on the Raiders 2015 season opener at home. We also hear a little clip from Coach Jack Del Rio's preseason wrap-up press conference. Raider Nation Podcast - Show #440: "Raiders show promise in pre-season opener"
Tim Brown took the stage in Canton wearing his gold jacket, and told the story of his great career. We hear some of his 33 minute speech, as he thanks former teammates, coaches, parents, family, and more. The Raiders reversed their fortunes against the team who embarrassed them 52-0 only five games ago. Even if it was only preseason, the Raiders showed continued improvement. Raider Greg was at the game and give his observations. Will the Raiders be moving to Los Angeles? Raider Greg think so. The owners met in Chicago and heard proposals from San Diego and St. Louis, but no proposals were submitted for an Oakland stadium. We hear thoughts from media and NFL observers Jason Cole, Andy Dolich, Ray Ratto, Tim Kawakami, and John Clayton. 03. The Prez of R.N.O.M. Music credit: The Raiders by Sam Spence; Back in Black by AC-DC; Should I Stay Or Should I Go? by The Clash; Bad to the Bone by George Thorogood. Raider Nation Podcast - Show #439: "Ken Stabler Tribute, plus Derek Carr 2015"
Music credit: The Raiders by Sam Spence; Back in Black by AC-DC; Wild Wild West by Will Smith; Funk 50 by Joe Walsh; Bad to the Bone by George Thorogood. 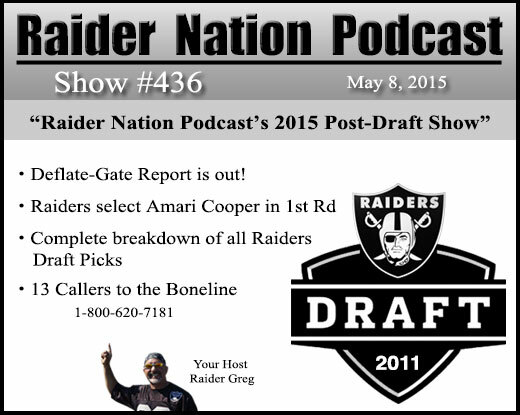 Raider Nation Podcast - Show #438: "Oakland Raiders getting ready for 2015 Season"
A tribute the Al Davis on the eve of his birthday, the 4th of July. Raider Greg reviews the abundance of tight ends, wide receivers and linebackers on the Raiders roster and their upcoming position battles. We also hear a recent media question and answer session with Raiders Linebacker Khalil Mack. The continuing saga of the Oakland Raiders stadium situation. Will they partner with the Chargers and share a new Los Angeles stadium. How does the recent stadium proposal for Coliseum City by developer Floyd Kephart play into the situation? We hear comments from Raiders superfan Dr. Death via an interview on the Raiders flagship station 95.7 The Game. We also hear an interview on the same station with developer Floyd Kephart, who defends his recent proposal. Raider Nation Podcast - Show #437: "Raiders OTAs, Stadium Update and more"
The Raiders finished their 3rd and final week of organized team activities yesterday, Wednesday June 3rd. Raider Greg gives his thoughts on how it went, and we hear the media sessions of Donald Penn and Head Coach Jack Del Rio. Raider Greg gives his thoughts on the stadium situation (Carson proposal and Oakland Coliseum status), then we hear a segment from the Raiders flagship station 95.7 "The Game" in which Greg Papa chats with former 49ers CEO Carmen Policy, who is heading up the Carson, California stadium joint project proposal for the Raiders and Chargers. We also hear an interview that ESPN's John Clayton did with Raiders owner Mark Davis, where Mr. Davis outlines what he would want in an Oakland stadium. Raider Greg goes over some of the rule changes for 2015, including the lengthening of extra point kick attempts and the addition of a few other new rules. We hear the thoughts on this topic from former head coach Herm Edwards, and from NFL insider Adam Scheffer among others. 12. Raider Sid "The Desert Raider"
Music credit: The Raiders by Sam Spence; You Haven't Done Nothing by Stevie Wonder; Changes by David Bowie; Back in Black by AC-DC; Bad to the Bone by George Thorogood. Raider Nation Podcast - Show #436 "Raider Nation Podcast 2015 Post-Draft Show"
Raiders legendary running back will forever live on in our memories. The official report on Deflate-Gate was released this week, and Raider Greg gives his opinion. The Raiders selected WR Amari Cooper. Raider Greg gives his comments and we hear from Amari himself via an interview shortly after he was picked with Greg Papa on 95.7 The Game. We also hear thoughts from Derek Carr and Khalil Mack from 95.7 also. We review all of the Raiders 2015 draft picks. 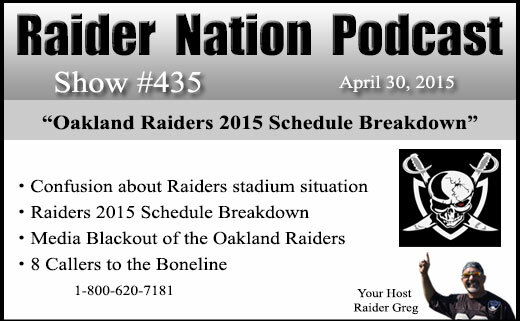 Raider Nation Podcast - Show #435: "Oakland Raiders 2015 Schedule Breakdown"
Get well Raider Mike. Our tailgating buddy, long-time friend and host of the Raider Fan Podcast had a hiking accident and badly injured his leg. We wish him a speedy recovery. Also, we want to send a shout out to the Golden State Warriors. Bring back the NBA Championship Trophy to Oakland! Segment #2: Confusion about the stadium situation - will it be Oakland or L.A.? Talk of two stadiums in Los Angeles. The Carson project has been approved. The Oakland city council approves work towards "Coliseum City" in Oakland. What will it be? Will the Raiders share a stadium with the Chargers, or stay in Oakland? Does anyone know? 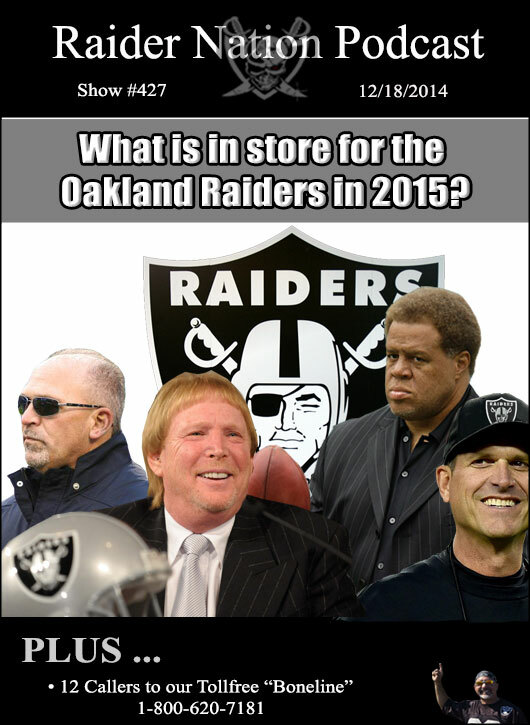 Raider Greg borrows from an article by RAIDERTAKE on the Raiders 2015 schedule. Are you tired of hearing the media coverage of the NY Jets? The Cleveland Browns? The Dallas Cowboys? What about the Raiders? Raider Greg wants to know. 08. 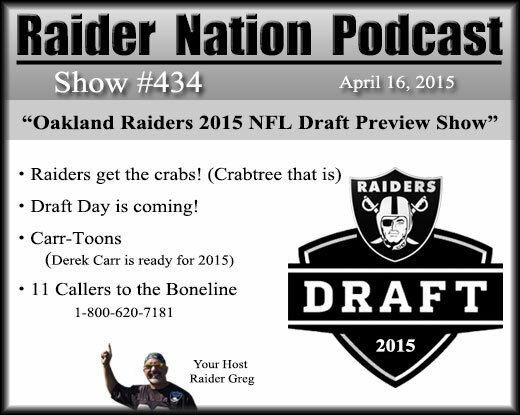 Raider Sid "The Desert Raider"
Raider Nation Podcast - Show #434: "Oakland Raiders 2015 NFL Draft Preview"
Segment #1: The Oakland Raiders get The Crabs! The Raiders signed wide receiver Michael Crabtree. Raider Greg gives his opinion on the signing. Segment #2: Draft day is coming! A pre-draft rundown of the Raiders needs and some ideas of who we should draft. Raider Greg thinks he sees a new, more mature QB in Derek Carr. We hear a recent Carr interview on Comcast SportsNet, and Raider Greg gives his opinion on what Carr said and what it means. Raider Nation Podcast - Show #433: "Raiders Improving During Free Agency 2015"
We review our 2014 players who were lost during free agency, and a few who we may still lose. The Commitment to Excellence Award dinner was held in Oakland recently, and we talk about this year's recipient Charles Woodson. We listen to an interview of Charles by JT "The Brick" that was done on the night of the award dinner. The Raiders didn't sign any huge names with the start of NFL free agency 2015, but they also didn't commit to the huge salaries that would have gone along with such signings. They did however sign some solid free agents, and we believe they have improved the team and set the framework for this year's draft. Music credit: The Raiders by Sam Spence; Back in Black by AC-DC; I got the Feelin' by James Brown; Bad to the Bone by George Thorogood. 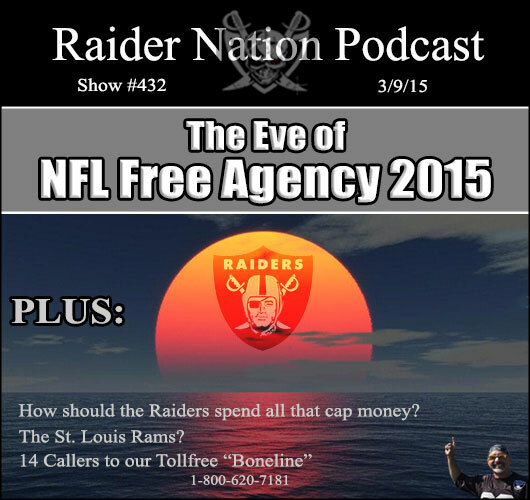 Raider Nation Podcast - Show #432: "The Eve of NFL Free Agency 2015 - GO RAIDERS!" 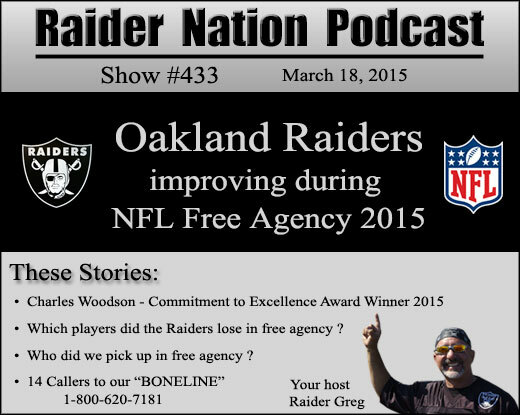 Segment #1: The Eve of NFL Free Agency 2015 - On your mark, get set, GO RAIDERS! The Raiders have the 2nd most cap space behind the Jacksonville Jaguars. How will they spend all that money? Can they get top free agents to come to Oakland? Free agency doesn't officially start until tomorrow (Tuesday), but Ndomukong Suh is already reported to be going to the Dolphins. Randall Cobb is staying in Green Bay. Where should the Raiders concentrate their free agent efforts? Raider Greg shares some ideas. Segment #2: The St. Louis Raiders? We've heard lots of stadium ideas for the Raiders, and now possibly moving to St. Louis? 03. Raider Joe in "Seacock Country"
05. Raider Sid "The Desert Raider"
07. ED from LA aka "Double O Raider"
12. Caleb "The Raider Optimist"
Raider Nation Podcast - Show #431: "Jack Del Rio, Tim Brown, Free Agents"
Raider Greg gives more of his thoughts on the hire of Jack Del Rio and what he has done so far to prepare for the Raiders 2015 season and beyond. We congratulate Tim Brown on his induction into the Pro Football Hall of Fame, and we hear comments from Tim Brown himself after his induction, from a phone interview on the Raiders flagship radio staton 95.7 "The Game". Segment #3: Oakland Raiders Free Agents - Who should stay and who should go? Raider Greg runs through the list of Raiders players who will be free agents and gives his opinion on which should stay and which should go. 03. Raider Sid "The Desert Raider"
Raider Nation Podcast - Show #430: "Raiders New Coaching Staff and Free Agent Frenzy"
The Raiders coaching staff is pretty much filled out, with the exception of defensive coordinator. The Raiders are rumored to be looking at Louisville’s Todd Grantham, and that position should be filled soon. Raider Greg reviews all of the new hires, including new offensive coordinator Bill Musgrave. We'll hear comments from several coaches and players who are familiar with Bill, from the Raiders flagship station 95.7 "The Game". Interviews include opinions from offensive guru Mike Martz, former QB Sage Rosenfels, and former Raiders QBs Rich Gannon and Steve Beuerlein. 04. Cali "The Raider Optimist"
06. "The Duke City Raider"
Music credit: The Raiders by Sam Spence; Back in Black by AC-DC; Jumping' Jack Flash by The Rolling Stones; Bad to the Bone by George Thorogood. 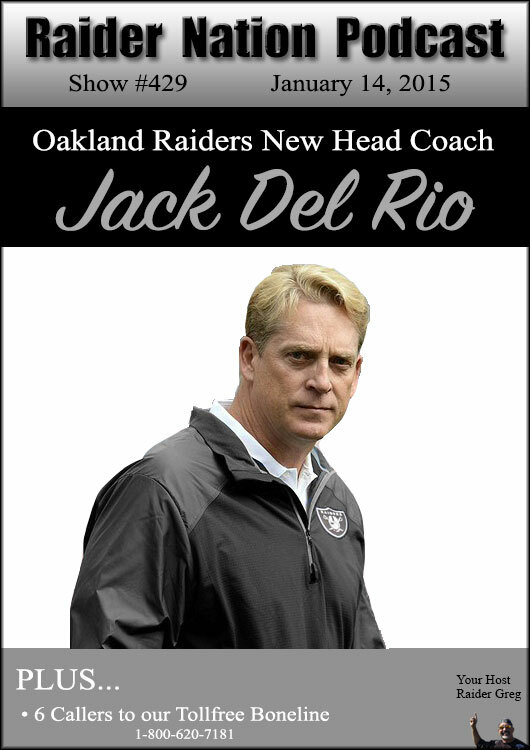 Raider Nation Podcast - Show #429: "Oakland Raiders New Head Coach Jack Del Rio"
The Raiders haven't made it official yet, so we hope all the media reports are accurate, but Jack Del Rio's hire as Raiders head coach has been widely reported to be a done deal. Reportedly a four year contract, we are expecting an official announcement to be made tomorrow along with a press conference. In this segment we hear opinions on Jack from various sources by way of the Raiders flagship station 95.7 "The Game". We'll hear from Greg Papa and John Lund, Dave Logan, Herm Edwards, and Marcellus Wiley. Raider Greg was very happy with the hire and gives you his thoughts. 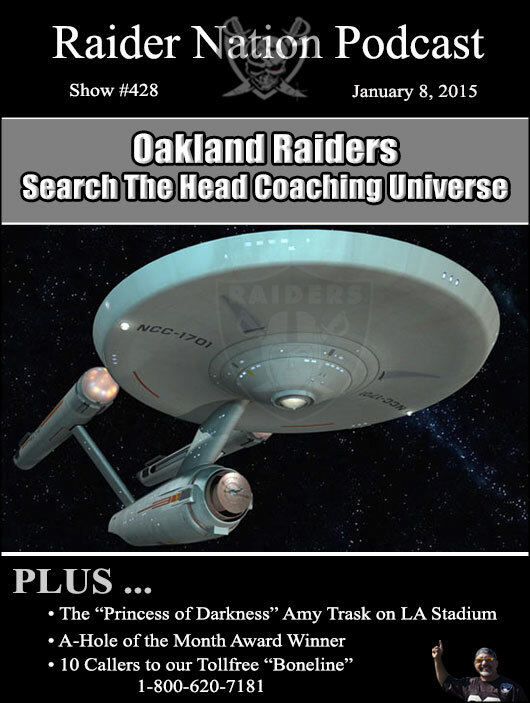 Raider Nation Podcast - Show #428: "Raiders Search The Head Coaching Universe"
There have been media "reports" of various head coaching interviews that the Oakland Raiders have completed and scheduled, and they may be getting close to an announcement. We listen to the thoughts of various NFL insiders via the Raiders flagship radio station 95.7 "The Game", and Raider Greg gives you his thoughts and opinions. Recent television ratings listed the Oakland Raiders as the least watched NFL team. A Bay Area sports talk host who has bashed the Raiders in the past was quick to mention this report, and he suggested that "Raider Nation" may not be very large at all, more like "Raider Village". Do you think the fact that the Raiders games aren't carried in many parts of the country could have something to do with the results of this poll? Segment #3: The Princess of Darkness Speaks! Former Raiders CEO Amy Trask comments on recent reports that the Rams may be building a football stadium in Los Angeles. One announcement concerning our podcast schedule. There will be no podcast during the week following the Bills game as we will be on vacation over the Christmas holiday. We will return after the Raiders' season finale in Denver. Also, remember that we will be continuing the podcast during the off-season as we always do. 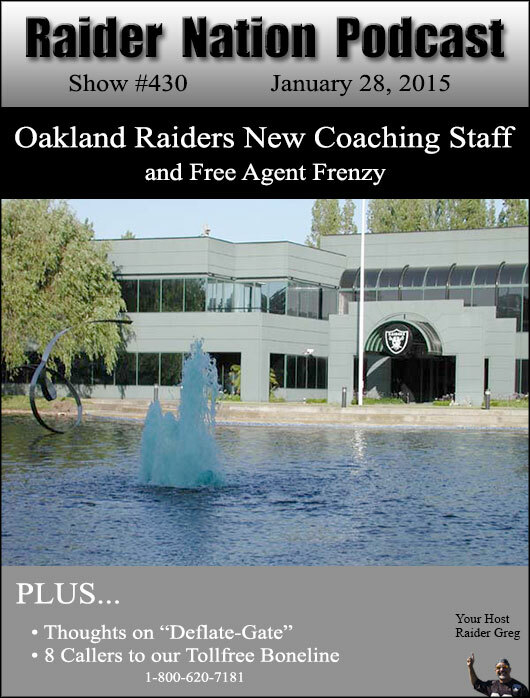 It may not be weekly, but we will put out a show whenever there is Raiders news to report. Segment #2: Raiders are 2-12 after loss to KC, what's in store for 2015? We won't have a Chiefs postgame segment of a Bills pregame segment. Instead, we will discuss Raiders coaching and management issues. We will hear from various media coverage on this topic. Included is audio from Comcast's Postgame Live show following the Chiefs game, with Bill Romanowski and Lorenzo Neal. We'll also hear some interviews from the Raiders flagship radio station 95.7 "The Game". Included are Tony Sparano's regular Monday interview, comments from Greg Papa and John Lund from "The Wheelhouse", and segments from the Damon Bruce Show. We hear from "The Professor" John Clayton, Hall of Famer Warren Sapp, and Superbowl winning QB Trent Dilfer. 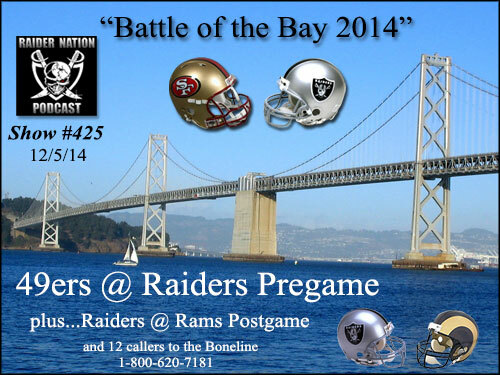 Raider Nation Podcast - Show #426: "Battle of Bay Postgame, Chiefs Pregame"
Raider Greg was there and shares what it was like to witness this epic game. We hear lots of clips from the Raiders flagship station 95.7 "The Game" along with game calls by Greg Papa via Raiders.com. We hear commentary from Bill Romanowski, Lorenzo Neal, Coach Sparano, Derek Carr, and more. The Raiders head to Kansas City to try their best to complete the 2014 sweep of the Chiefs and possibly play spoiler to the Chiefs playoff hopes. The final score of 52-0 Rams pretty much says it all. We hear Raider Greg's opinions plus segments from the Raiders flagship radio station 95.7 "The Game" which include thoughts on the game from Greg Papa, John Lund, Bill Romanowski, Brad Gilbert, Henry Wofford, and Rod Woodson. 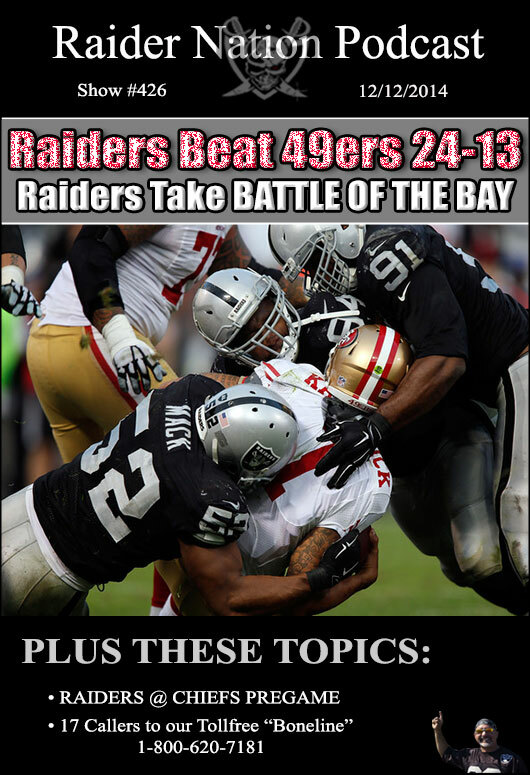 Can the Raiders possibly beat the San Francisco 49ers in Oakland. Most people don't think so, but some do and we'll hear those opinions. 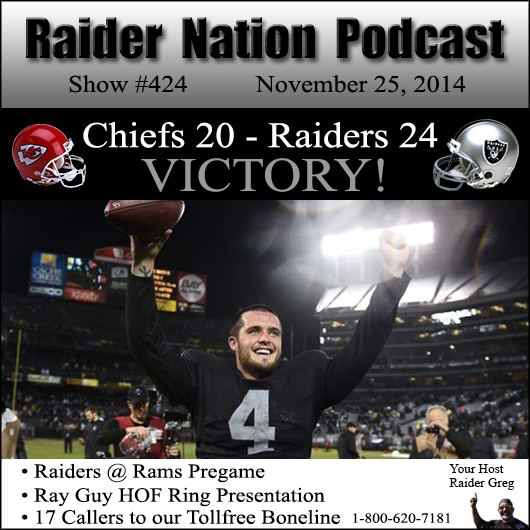 Raider Nation Podcast - Show #424: "Chiefs Postgame/Rams Pregame"
This Chiefs @ Raiders postgame review features comments from Trent Dilfer on Derek Carr (from 95.7 "The Game"), Charles Woodson, Greg Papa, Tom Flores, Bill Romanowski, Lorenzo Neal, Raider Greg and more. We also hear pregame comments and predictions from broadcasters Rich Eisen and Jim Nantz. Raider Greg recaps the halftime Hall of Fame ring presentation for Ray Guy at the Chiefs game. Many of the Raiders Hall of Famers were on hand at the game wearing their gold Hall of Fame jackets, including John Madden. Pregame analysis of this matchup between the Raiders and the Rams in St. Louis. Music credit: The Raiders by Sam Spence; Back in Black by AC-DC; Oaktown by MC Hammer; Bad to the Bone by George Thorogood. 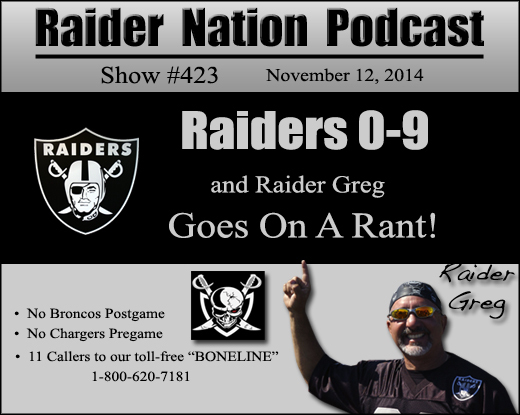 Raider Nation Podcast - Show #423: "Raiders 0-9 and Raider Greg Goes On A Rant!" 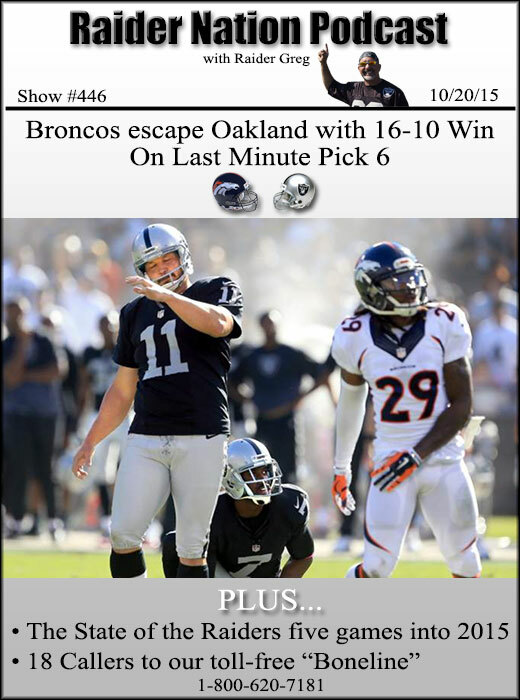 The Broncos defeated the Raiders in Oakland and Raider Greg is not in the mood for a post-game recap. He's not even in the mood for a pre-game preview of the Raiders at San Diego Chargers. So this show will basically be a rant on the state of the Raiders and their future. 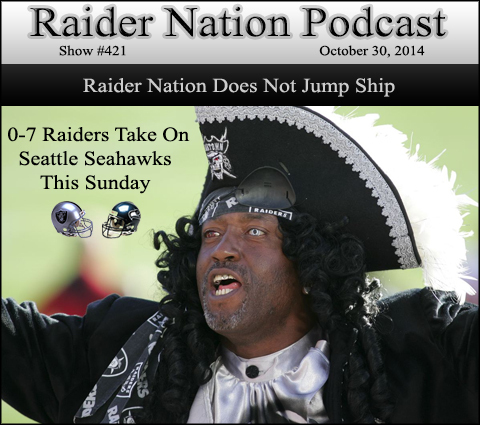 Raider Nation Podcast - Show #421: "Raider Nation Does Not Jump Ship"
No post game or pre game show on this podcast, just a commentary on the feelings and thoughts of the Raider Nation as we move through troubling times.